It was a big weekend for two R.I. powerhouses, who most are predicted will be battling it out for the team title at the State Meet in less than two months. For the 11th time since 2000, Bishop Hendricken earned the crown at Saturday's Manchester Invitational. The Hawks collected just 49 points and had a gap of just 30.4 seconds between their No. 1 and No. 5 runners. Hendricken had its top 3 runners among the first nine finishers, led by a runner-up finish from Aidan Tierney, who was timed in 15:56 for the 5K course. Jack McMahon secured eighth overall (16:10) and Matt St. Jean placed ninth (16:12). At the Bowdoin XC Classic in New York, also on Saturday, La Salle Academy claimed the Division 1 race, defeating Haddonfield Memorial (NJ), 29-53. The Rams averaged a crisp 16:36 for the difficult 3.1-mile terrain at Bowdoin Park, site of the Nike Cross Nationals Northeast Regionals. Joseph dos Reis placed fourth overall for La Salle with a time of 16:27.6. 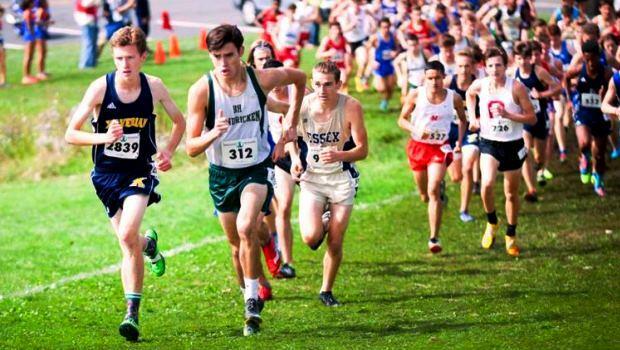 He was followed across them line by Domenic Campagna (fifth, 16:36.10), Max DiMuccio (sixth, 16:45), Alex Menard (ninth, 16:54.90) and Jack McLaughlin (tenth, 16:58.0). In the girls' Division 1 race, La Salle finished second to Niskayuna (NY) by a score of 67-76. Kaylie Armitage was the top Ram finisher, placing third in 19:42.40. McKenzie Doyle was ninth overall at 19:58.90.